Ok, guys, I saw this book survey and loved it, so I thought I'd join in on the madness! It was a bit long though, so I split it up into two posts. I'll post the first half here, today, and the second half tomorrow on the last day of the year! To see part 2, click here. -Oh gosh. Don't make me pick! Oh, so hard. I think that if I really had to pick, it'd be Delirium by Lauren Oliver. It was just one of those books that stuck in my memory and left me dying for more. I'm still on edge for Requiem (the final installment of the series) to come out. -Ok, I have two on this one. The first is Defiance by C.J. Redwine. I waited for what seemed like an eternity for this book to come out. I was so excited, ready to read it. The cover art was beautiful, and I was pretty sure that the story would be so intense. I even gave it four stars right after reading it. But, after sitting on it for a bit and thinking it through, I realized just how awful the book was compared to my expectations. It was alright, but nothing dazzling. -Ugh. Biggest disappointment of all: Tiger's Destiny by Colleen Houck. I was SO. FREAKING. PUMPED. about this book. And what was it compared to the other three? Crap. Ugh. I barely skimmed the ending. This one seriously made me sad. -Hm. Probably Fire by Kristin Cashore. I was really disappointed that this book was not going to be from the viewpoint of Katsa (the main character of Graceling, the first book). I thought that the series was definitely going downhill after book 1. In the end though, Fire turned out to be my favorite of the three books. -Definitely Delirium by Lauren Oliver. Like I said previously, it was just a wonderful book that stuck with me. Probably one of my favorites in YA. -This one is really hard. I guess you could say the Percy Jackson and the Olympians series. I'd heard of them before, but I've never read them before this year. I was really excited to get to read them after hearing all the hype. -Probably Ally Condie. I read the Matched series this year, and I loved her writing. She did really well, and I can't wait to see what else she'll come up with in the future. -I'd say this one goes to The Book Thief by Marcus Zusak. Before this book, I had scarcely picked up anything non-distopian or non-fantasy , but this book knocked me off my feet and definitely had me hanging on edge. I loved this one, even though it wasn't something I'd have typically read. It definitely opened my eyes to a broader spectrum of books. -Insurgent by Veronica Roth. I'd read Divergent last year, unable to put it down, and this time I was definitely on edge. I don't think I put that book down for a minute after I got it. -This is probably going to be (don't get bored with me) Delirium again. I've read this book several times already, and don't doubt that I'll read it several times again. 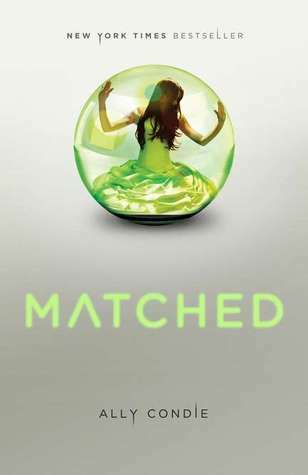 -Definitely Matched by Ally Condie. I'd say the cover was the only reason I picked up the book in the first place, but once I read it, I fell totally in love. Just look at it. -Surprisingly enough, it's good old Santiago from The Old Man and the Sea by Ernest Hemingway. Was it my favorite book? By no means at all. Not even close. But, since the book is so centrally focused on the Old Man and him alone, and since he goes through a large ordeal that only a handful of people could successfully make it through, he's pretty hard to forget. -Pride and Prejudice by Jane Austen takes the cake on this one, I believe. Oh, the writing in that one was absolutely gorgeous. -This one happens to be yet another unusual read for me, definitely out of my normal genres, The Last Lecture by Randy Pausch. This one had me seriously thinking about life when I was done reading it. It was a dying man's account of his life, and it definitely caused me to want to live life to the fullest. -Dude. Freaking Legend by Marie Lu. It'd been on my TBR list from the day it came out (November 29th, 2011), but I didn't end up reading till extremely late this year. I couldn't believe that I had waited so long to read it when I was done. It was extremely good. -Shortest: The Old Man and the Sea by Ernest Hemingway. It was so thin you could barely see it. -Longest: Inheritance by Christopher Paolini. Yowza, she's a biggun. -There was one scene in Pandemonium by Lauren Oliver that I literally think made my heart stop beating. I called my best friend, Abby from Wintry Words immediately after I finished reading it. I won't say which scene for spoilers, but oh my goodness. Just writing this is making me a little edgy. 18. Favorite Relationship From A Book You Read In 2012 (be it romantic, friendship, etc)? -It's about to get all cliche up in here. But, I read The Fellowship of the Ring by J.R.R. Tolkein this year, so of course, I must say the friendship of Frodo and Sam. You just can't beat that. 19. 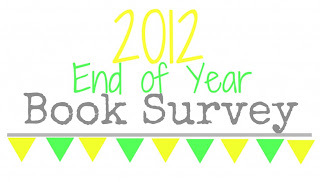 Favorite Book You Read in 2012 From An Author You Read Previously? -Once again, I have to go with Insurgent by Veronica Roth. I love her writing so much, and this book definitely did not have a "bridge book" feel to it, even though it was the middle of the trilogy. 20. Best Book You Read That You Read Based SOLELY On A Recommendation From Somebody Else? -The Naming by Alison Croggon. I read this one, not really knowing how good or bad it would be, merely because my best friend had told me that she loved it. So, I read it. And BOOM. Masterpiece. Yesss Delirium was amazing! I haven't read some of your picks, but now I definitely want to read them soon! Awesome. I thought the same thing when I read yours :) And thank you so much! I spent forever working on it in Photoshop yesterday. I'm glad someone likes it. I was worried. Haha :) And I saw that you changed yours the other day too! I like the blue. It's very pretty. Maggie (Raindrop Reads) has read 2 books toward her goal of 55 books.